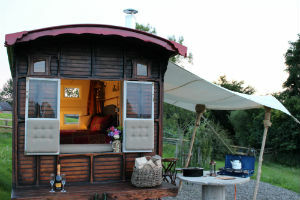 Treberfedd Farm in West Wales along side two luxury eco cabins for high end glamping offers Dora an Edwardian Caravan. It’s a great place for families to escape to the beautiful welsh countryside for a farm holiday The Farm is only a fifteen minute drive from the stunning coastline of Cardigan Bay and ideally located in the beautiful Aeron Valley, between the picturesque Georgian harbour town of Aberaeron and the historic university town of Lampeter. Being so close to the famous Cardigan Bay coast there are many fantastic beaches, coastal paths to walk, and incredible wildlife to discover such as the bottle nosed dolphins which can be seen on locally run boat trips. The seaside towns of New Quay and Aberaeron are worth a visit and stroll around, as are the university towns of Aberystwyth and Lampeter, and also the county town of Cardigan which lies to the south. 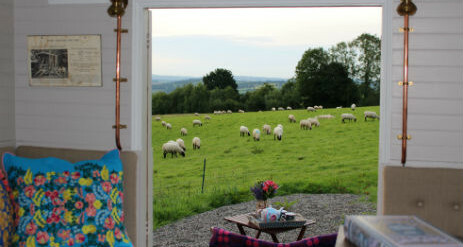 Relax and enjoy the gentle pace of country life in this romantic and tranquil setting on our working organic farm. 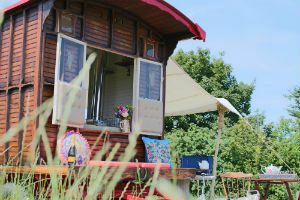 Dora the Edwardian Caravan offers a secluded and beautiful setting in an organic meadow with far reaching views over green rolling hills. We are only a short drive to west Wales’ Cardigan Bay coast and sandy beaches, coast path and quality seaside eateries. 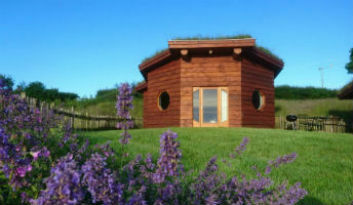 Whilst holidaying with us, you are also free to explore our farm trails and woodlands. 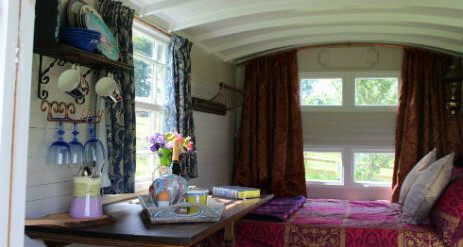 Let the Edwardian horse drawn caravan transport you back to a time when the pace of life was slow. Enjoy her comforts while sitting by the fire. 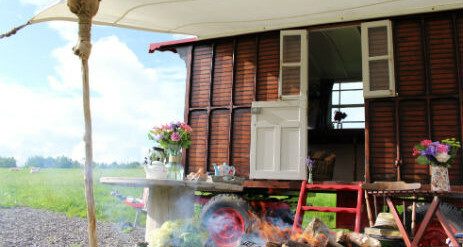 The vintage caravan ticks all the boxes for a romantic glamping holiday. After a colourful life Dora is now gently residing in a Welsh meadow waiting to offer you one of the most tranquil holidays you’ve ever been on. 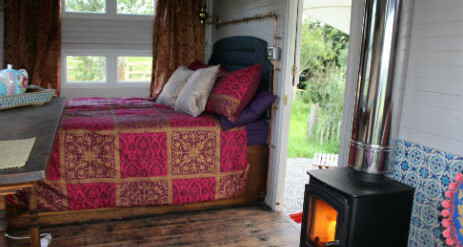 Inside there is a full size double bed topped with duvet and pure wool welsh blankets. Wood burning stove for cosy nights. Private cooking and dining with an outdoor gas stove under a canvas awning for cooking and tea making, outside fire pit for long summer evenings. Relax and unwind in the outdoors. Simplicity at its best! 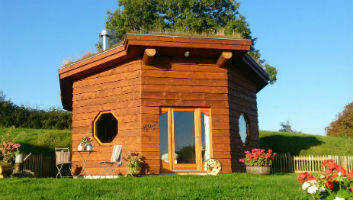 Just a short walk to the fully equipped and heated wc and shower cabin. Wash basins, baby change and washing up facilities. 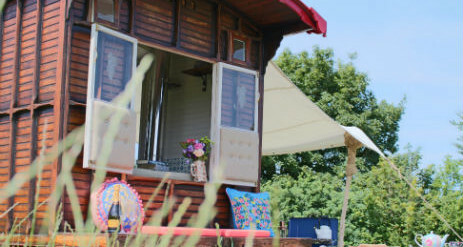 The caravan is equipped with everything you need for your stay, linen, cooking equipment and a complimentary basket of logs and kindling is provided. Onsite laundry available. Visit our small organic farm gift shop selling our own organic lamb and eggs from the farm. Local Ice cream, milk, butter, bacon, sausages, charcoal, home grown firewood, gifts and more is also available. Built by Bertram Hutchings, in Winchester around 1911, this horse drawn caravan has always been used for holidays and high days. 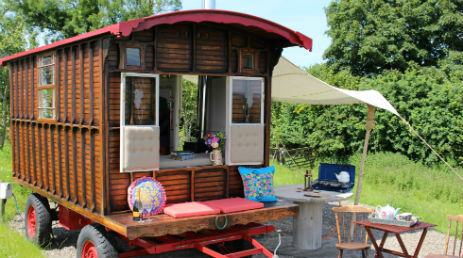 She was originally offered for hire, with or without a horse supplied, to customers taking a holiday in the New Forest. Customers could buy hay for the horse from local farms and pitch up in the forest. Caravan holidays were definitely the new ‘in’ thing before the First World War abruptly halted such reverie in 1914. At another time it was owned by a gentleman who used to tow it behind his pink Rolls Royce and take it to festivals. 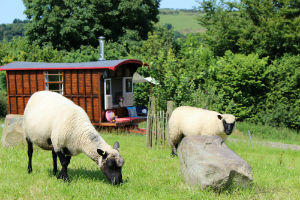 ALSO AT TREBERFEDD – LUXURY ECO GLAMPING CABINS!